Firefighter Patrick Byrne teaches cadet Libby Hogg, a grade 11 student from Oak Bay how to brace herself when using a high pressure hose. For most teenagers, spring break is a chance to relax, sleep in and generally take a break. 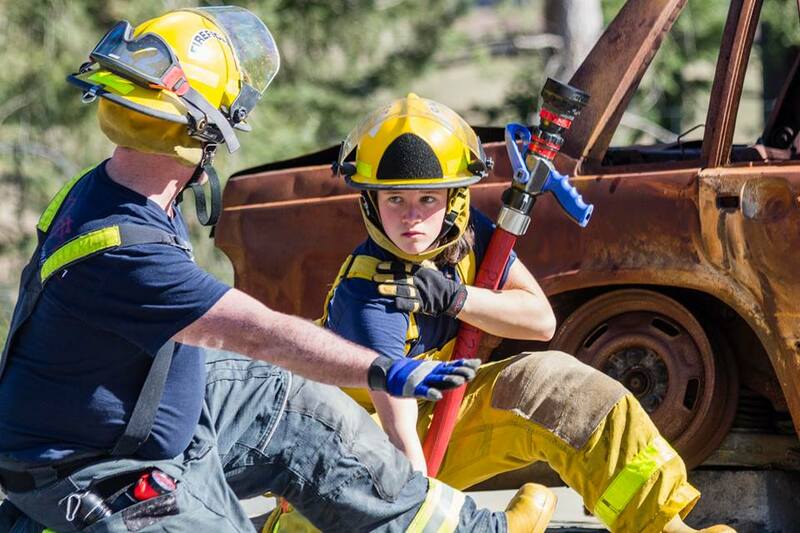 However, there won’t be any R&R for those enrolled in the Gulf Islands Fire and Rescue Cadet Camp this week on Pender Island. “We hit the road running,” Pender Island Fire Department Assistant Chief Adrian Hanson said. Every day this week, the cadets are at the fire hall at 7 a.m. ready to work hard all morning, learning everything from how to put on their gear to going into live fire scenarios at the department’s new simulation building. The camp is held jointly between Pender Island Fire Department and the Salt Spring Island Fire Department. This year, 25 cadets are taking part, making it the largest cadet camp since it started in 2005. This will be the first event to take advantage of the Pender Fire Department’s new simulation facility, which allows for realistic car, propane tank, dumpster and pool fires, as well as a state-of-the-art four-storey live fire training building custom built to the department’s specifications. Though the emphasis will be on fire fighting, the cadets will get a chance to see how other emergency responders function. Some other demonstrations include a Royal Canadian Air Force Cormorant helicopter, Canadian Coast Guard hovercraft, Royal Canadian Marine Search and Rescue cutter from Salt Spring Island and the RCMP vessel from the Outer Gulf Islands detachment. The cadets will also receive their emergency first aid certificate from the Red Cross upon completion of the camp. Cadets get a real-life experience of what it is like to be a first responder. That experience is not limited to just responding to calls, but includes things like mopping the floors, cleaning the bathrooms and working long hours. The experience is intense as cadets have to be on alert 24 hours a day for six days. The hard work pays off, though. Prochaska explained that past cadets have often gone on to work in the first responder field, either as a firefighter or in some other branch of emergency response. The camp relies heavily on volunteers. Around 50 people from Pender and Salt Spring are involved in this year’s camp. Firefighters from Salt Spring are on hand to help instruct the kids, and to act as chaperones during the overnight stay on Pender. By the end of the week, the cadets are empowered and work hard.